“We are devastated. Wala na mahitsura diri (It’s chaotic here),” he said. Video: Mga nasalanta ng Bagyong Yolanda sa Daanbantayan, Cebu, binisita ni DILG Sec. Roxas. (‘Victims of Typhoon Yolanda in Daanbantayan Cebu visited by DILG Secretary Mar Roxas’). GMA News, 13 November 2014. “At my age, at 61 years old, (Super) Typhoon Yolanda was the strongest typhoon that I had ever witnessed,” Jovencia S. Pastor, a local market vendor, remembers. was surprised because 400 pieces of corn were sold before 08:00. These were being bought up by evacuees in the civic center. “After that I went home already. I almost crawled because of the strong winds and there were fallen trees along the way,” Jovencia remembers. The Bogo civic center is more than a decade old, and the largest in northern Cebu. During Super Typhoon Yolanda, it would serve as an evacuation center for more than sixty families. 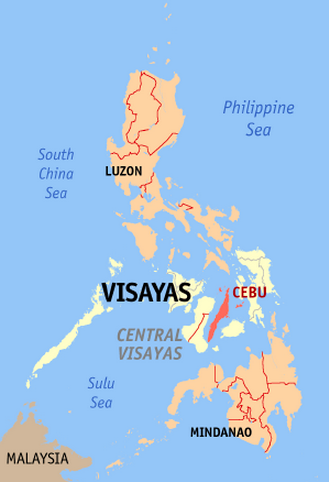 The municipality of Daanbantayan which is located in the northern tip of Cebu was not spared by Super Typhoon Yolanda. On first sight, it is can be quite difficult to believe that the colorful municipality of Medellin was once devastated by Super Typhoon Yolanda. “Our public market was built in 1960s when I was still in my elementary days,” remembers Rodney P. Menchavez, a local municipal engineer. that could bring about this kind of destruction.